We'll have an edition of the SPC Soapbox later this evening. For now, coming off the heels of our Sonic: Lost World review, we have another platformer to put under the microscope. This time the game comes from Shin'en Multimedia, creators of many exciting and very good looking retail and downloadable games for Nintendo hardware. Their next offering is Jett Rocket II: The Wrath of Taikai. If there is a name that is synonymous with technical proficiency with Nintendo hardware that isn't Nintendo, that name would have to be Shin'en. At the very least with every game that comes from the German developer you are sure to be blown away by how much Shin'en can get out of the system they're creating games for. We've seen this with the Game Boy Advance's Iridion, the Nintendo DS' Nanostray, the Wii's FAST Racing League, and the 3DS' Nano Assault. Now, for their new game, Shin'en has returned the world of Jett Rocket, a beautiful 3D platformer on WiiWare. This time around, however, the main character isn't just limited to 3D areas. Is Jett Rocket II: The Wrath of Taikai a game that launches into the atmosphere or simply makes a crash landing? 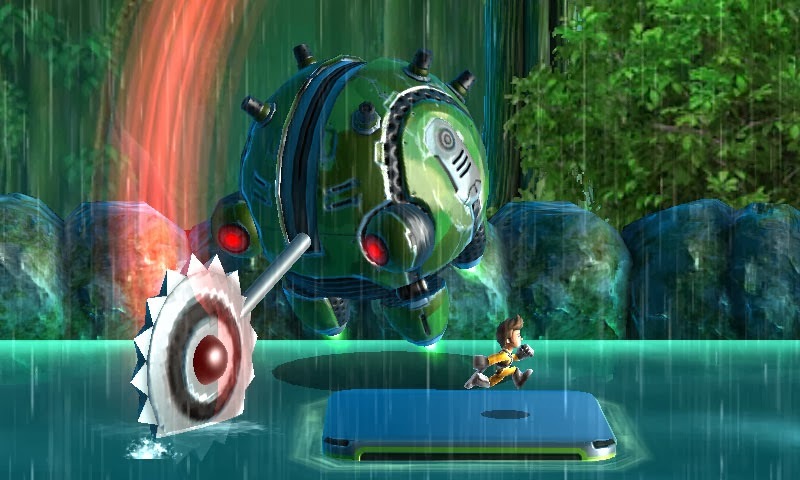 As is typical of a platformer, the plot of Jett Rocket II is just a means to play the game's fifteen levels. Kaiser Taikai has bot-napped Jett's robotic friends, and now our hero must venture through said levels to break each shanghaied bot from captivity. There are three worlds in total in Jett Rocket II, and each world houses five levels. 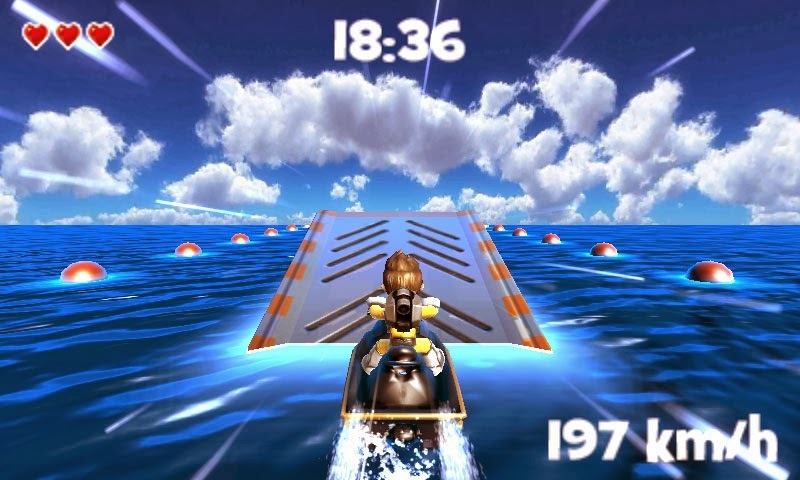 The variety of levels is rather high, with some levels being completely 2D, some 3D levels with a fixed camera angle, and fully realized 3D levels. All of these levels bring a steady challenge that presents the player with a fair and balanced difficulty curve. 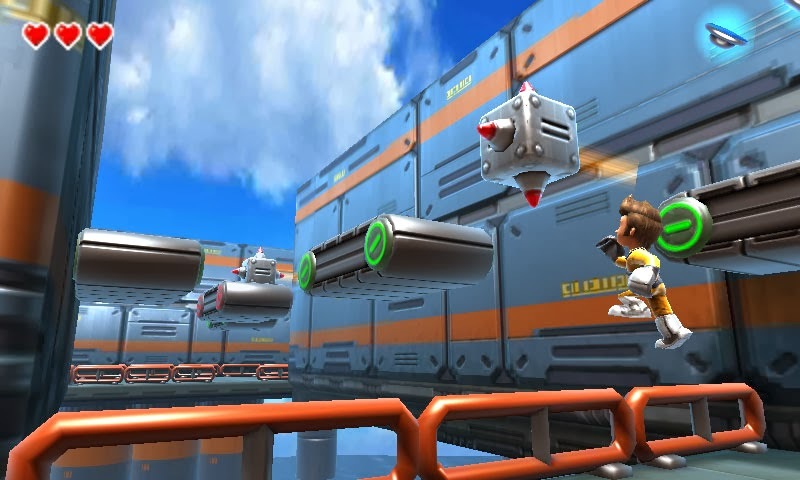 Checkpoints are placed at smart locations, meaning that you seldom have to do large portions of levels all over again. indigenous life of this jungle. To say there are plenty of obstacles and enemies to get in the way of Jett's objective to free his robotic companions is an understatement. There are turrets that fire laser balls, barrels that let loose flames, moving platforms, shifting spikes, objects that when grabbed float up in the air like helicopters, and much more. Each level is also brimming with secrets to uncover. There are approximately 25 different photos of characters, objects, and enemies within the game to collect. These are hidden throughout every level, and usually in some truly tricky spots, either requiring sublime exploration or tough jumps to collect. Nabbing all of the photos unlocks a bonus mini-game on the main menu. In addition to photos, each level records how many secrets, capsules full of Solarcells, the currency of the game, Jett uncovers as well. Regardless, Jett Rocket II: The Wrath of Taikai can deceitfully lead players to believe the game is rather on the short side. After all, the 15 levels, 3 bosses, and side games don't take too long to complete. However, once the main game is beaten, a new unlockable mode opens up. 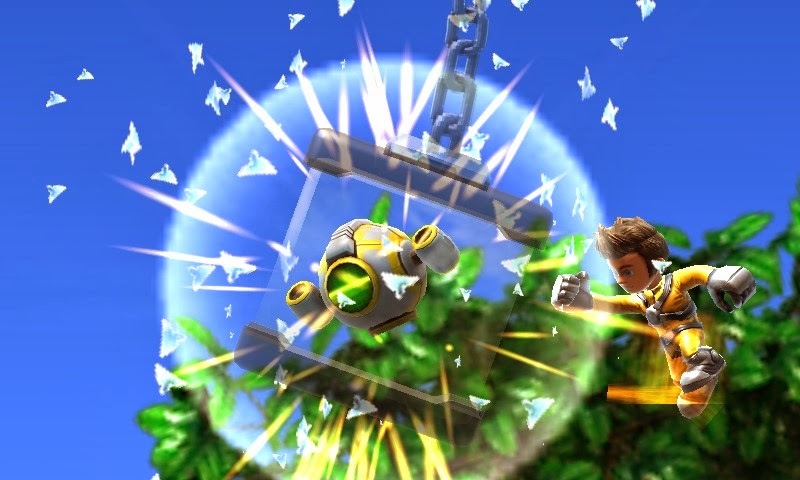 This new Mirror Mode tasks players with entering remixed versions of the main game's levels, only this time Jett needs to collect five Golden Solarcells to unlock the captive robotic creature held up in its cage at the end of the level. This no doubt extends the replay value considerably, and it simultaneously alleviated any worries I had of consumers not getting their money's worth by picking the game. The fact of the matter is that the content in Jett Rocket II justifies the cost easily. but each have their own tactics. 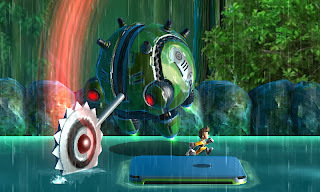 Jett has an arsenal of moves and technology to assist him on his adventure. For one, he can jump once and then curl up to jump again, using this move as an attack on enemies. He can also make like Mario and perform wall jumps. In certain levels there are Jettpack upgrades (Jettpack-- get it? har-har) that allow Jett to have more functionality, such as blasting off into the air with the rocket attachment, summoning platforms that move in the direction Jett is looking, and a helmet that allows Jett to swim underwater for a limited time. While Jett's move set isn't filled with a great variety, it does allow for an accessible control scheme for beginners and experts alike. Perhaps my only complaint with how Jett feels when controlling him is that his speed is just a few notches too slow for my liking. I would have preferred him to run a little bit faster. Speaking of speed, Jett Rocket II runs really well on the Nintendo 3DS, as you would expect out of Shin'en. The game is locked at a steady 60 frames per second, even with the 3D slider turned up. However, the 3D effect isn't as pronounced as other games on the system. I wanted to see more depth within the screen. As for the aesthetics, Jett himself looks a little too plastic doll-like and a bit generic as a character. Bosses sadly simply appear to be palette swaps, despite their attacking tactics and patterns being entirely unalike. Backgrounds are detailed well, and things like lighting and textures are tremendous for a 3DSWare game. 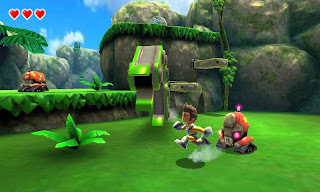 Jett Rocket II: The Wrath of Taikai is a recommended game for Nintendo 3DS owners to add to their digital collection. It has plenty of variety and challenge in its levels, well placed secrets, and impressive tech behind it. While it has its problems (e.g. slow character movement, only one save slot, occasional camera annoyances), Jett Rocket II is a must for platforming fans of all ages. Godspeed, Jett. Godspeed.